From first-time Mexican author and illustrator Duncan Tonatiuh comes the story of two cousins, one in America and one in Mexico, and how their daily lives are different yet similar. Charlie takes the subway to school; Carlitos rides his bike. Charlie plays in fallen leaves; Carlitos plays among the local cacti. 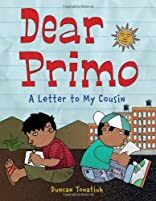 Dear Primo covers the sights, sounds, smells, and tastes of two very different childhoods, while also emphasizing how alike Charlie and Carlitos are at heart. Spanish words are scattered among the English text, providing a wonderful way to introduce the language and culture of Mexico to young children.Inspired by the ancient art of the Mixtecs and other cultures of Mexico, Tonatiuh incorporates their stylized forms into his own artwork. About Duncan Tonatiuh (Author) : Duncan Tonatiuh is a published author of children's books. A published credit of Duncan Tonatiuh is Dear Primo: A Letter to My Cousin.